This is ONE pattern for a whimsical toy that works up to approx. 10” (25cm) tall. (or smaller with different yarn and hook sizes). They can be made into rattles, and the textured, bouncy petals are loads of fun for little fingers. With this pattern, you can make 2 types of flower, in any color combinations (Curly Petals or Long Twisty Petals). 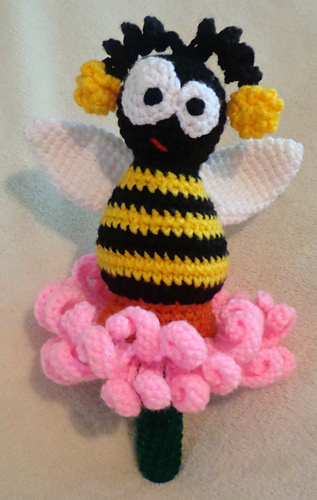 This pattern works the rattle base up in one piece, with only the eyes, antennae and wings to sew on. Photos are included to assist with proper placement and assembly. The pattern is in English and uses US Standard terms. It contains instructional photos, detailed instructions and grants permission to sell the finished toys. 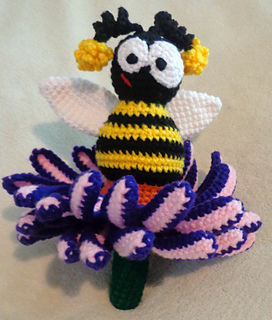 in the following colors: Green, Orange, Black, Yellow, White, ½ Skein of Pink (or your choice of color (s) for the petals), 2 Small (20mm) Rattle Inserts OR 1 Large (39mm) Rattle Insert, Black yarn or embroidery thread for facial details, Sewing needle, Scissors, Polyfill Stuffing, Stitch Marker. Gauge is not essential to this project, but be sure that your hook size and tension creates a fabric without holes.